When people are in the process of implementing a Kanban system, they often look for answers to the following questions: How are we going to prioritize the tasks and projects coming in? How do we know which tasks to start first and how do we know when to do so? The solution we found for our implementation is that we agreed on a specific order and allocation of the tickets (= tasks) in the input queue to indicate their priority (most important/urgent ones go first). Additionally, we decided to visualize the classes of service by using different colors and adding specific details on the individual tickets. On the ticket itself you will find information like title (short description), tracking number (serial number) in the upper left corner, date of entry (date when the ticket was put on the board) in the lower left corner, and, in case of a priority ticket, a due date (if applicable). Once a task is finalized, a done date is added in the right hand corner of the ticket for tracking reasons (due dates are updated, if not concurrent). The colors and respective descriptions on the tickets also help to bring them in order during our Replenishment Talks. I specifically say “talks” since we do not hold “real” Replenishment Meetings (anymore). We replenish when there is need for it. That means that we got rid of the often very time-consuming Prioritization and Replenishment Meetings and perform them on-the-go. When it comes to Kanban board design, I think it is a good idea to start simple – you will figure out soon enough what you need to add or what you need to change. Others’ Kanban boards might help you collect ideas on how to build your own, but don’t think of them as a blueprint and don’t expect them to work for yourself just like that. Then visualize everything on your board. You might not be able to get everything “right” the first time, but you will gain new insights every time you think it through. Some of the specific details will miraculously appear to be obvious after some time of using the system. It is quite obvious that we were using a very simple structure with only four workflow steps and started with (in my opinion) high WIP limits of five for Development, three for Test and three for Deployment (with a team of four developers). I have spoken with a lot of teams that struggle with the decision between a physical whiteboard or an online version of their Kanban board. Having tried out both options, I personally prefer the physical one but of course it depends on a lot of factors – like e.g. layout of your office, team size, whereabouts of your team etc. If the team members are scattered throughout different areas of the country or the world, a physical board would be quite a challenge, as it cannot be easily maintained and is not directly accessible to everyone. In that case, online tools like kanbanery, agile zen or LeanKit Kanban might be a better choice. Whether you are using a physical or an online board – the visualization of your work flow and tasks will surely help you create more transparency, give you opportunities to improve your processes and to manage some of your risks. The Tupalo Kanban Story – How to get started? After having presented the Tupalo.com Kanban Story at a couple of events and conferences, I would like to share some of our findings and experiences in a few blog posts. Each post will cover a different Kanban topic that has been of interest in discussions after the talks I have held on our Kanban implementation. There are already a lot of blog posts on the web giving useful tips on how to start with Kanban. Like others, we choose a very simple approach. We took the time to do some in-depth research on the topic and then we gave it a try. As a starting point and summary, have a look at the Kanban principles and practices that David J. Anderson put together in his book Kanban, Successful Evolutionary Change for Your Technology Business. But wait a minute – why did we start in the first place? Well, that is also quite an easy question to answer. At the time we had the feeling that we were working on too many projects at the same time; needless to say that this resulted in a low throughput. Also, priorities were not always clear to us, and when the respective stakeholder was not at the office, the team sometimes did not know which task to start next. With our Kanban system we were able to pretty much overcome those as well as other issues, leading to improvements and a smooth flow. The Tupalo.com Kanban Story – ON TOUR (3)…LKSE 2012 – Buenas días Madrid! I guess it’s time again for a new update on our journey through Kanbanland. 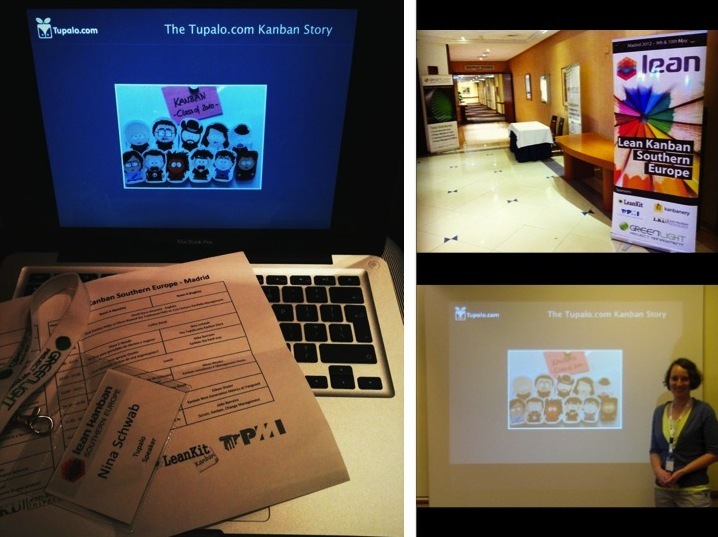 Last week I had the honor to present “The Tupalo.com Kanban Story” at the Lean Kanban Southern Europe 2012 conference in Madrid. The LKSE12 conference was held for the first time and was packed with interesting talks around Kanban, Lean, Product Development and Risk Management. Since the emphasis of the conference was laid on experience reports I decided to sum up our challenges and discoveries in a little case study. During my talk I gave an insight into the implementation and evolution of our Kanban system over the last 1 ½ years. @pawelbrodzinski: Introduction of kanban helped to realize that the process in fact is different than the team thought. @shuabee #lkse12 Same experience here. 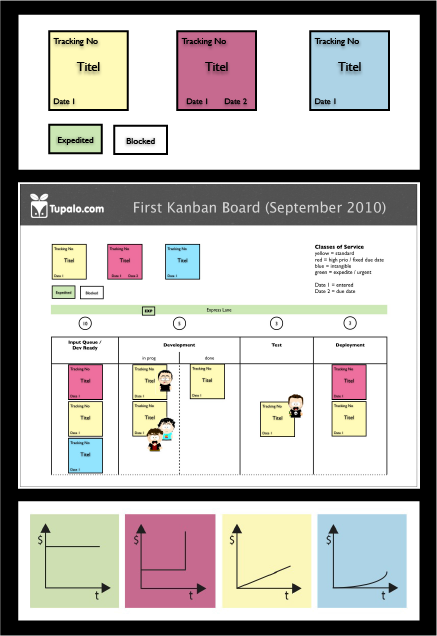 @pawelbrodzinski: And over time the kanban board became way more complex. @shuabee #lkse12 Again, I share that experience. All in all I can say – I heard some great talks, met with great people and had a great time! 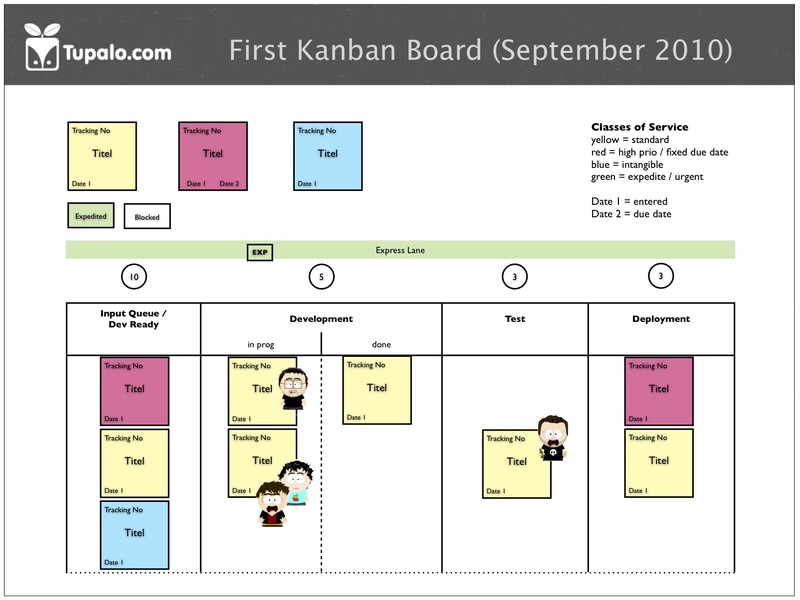 For those of you who want to hear more about “The Tupalo.com Kanban Story” I will mention some of our findings and experiences in more detail in the next blog posts. 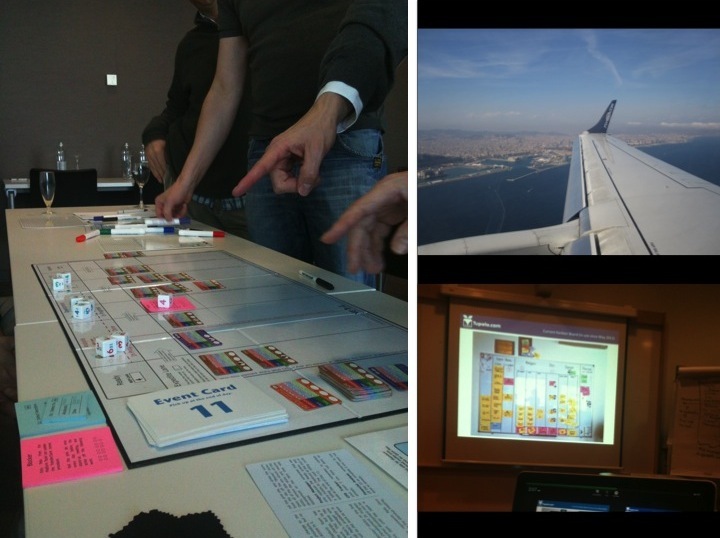 The Tupalo.com Kanban Story – ON TOUR (2)…Leadership Workshop Barcelona! At Tupalo.com we always like to travel…also on business. This time, the father of Kanban David J. Anderson invited me to present the Tupalo.com Kanban Story at his Leadership/Coaching Workshop in the lovely city of Barcelona. The 3-day workshop was filled with interesting insights and useful methods every Kanban practitioner should know about. That did not only mean listening to helpful theory and our case studies but also rolling the dice at the GetKanban board game. Tupalo.com runs on Kanban and Nina is the one, who makes it happen. You may have read her blog post from about a year ago, where she explains how we implemented Kanban at the beginning at Tupalo.com. Well, it’s been a great year of Kanban-ing for us and even David J. Anderson “the father of Kanban”, was impressed enough with our work, that he invited Nina to present the Tupalo.com Kanban Story at a leadership seminar he held in Vienna yesterday as well as at the Lean & Agile Coffee in the evening. The presentation was well received, there were tons of questions from the audience and judging from the enthusiastic reactions on Twitter etc., it seems like there will be even more Kanban boards hanging in other offices around Vienna in the near future! 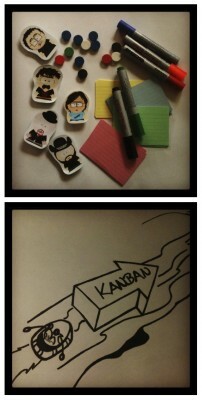 Cabana, Kamikaze, Kobold… No – it’s KANBAN!!! We did it! Last week we implemented KANBAN (= methodology of incremental process improvement/pull system approach) at Tupalo.com HQ here in Vienna. After reviewing various theories of agile management over the past weeks and months, KANBAN became our best friend. Not seeing it as an actual ‘new’ project management approach but rather as a methodology to improve our internal processes, we added a visual element to our daily work life – the KANBAN Board: transparent, colorful and extremely useful when it comes to just-in-time updates on our status quo. We visualized our workflow and added WIP limits to each work flow step. Thus we now concentrate on a few work items at a time, achieve a sustainable pace of development and improve quality. We soon got used to the new ‘rules’ of the system and letting it evolve – which (by the way) worked out fine. 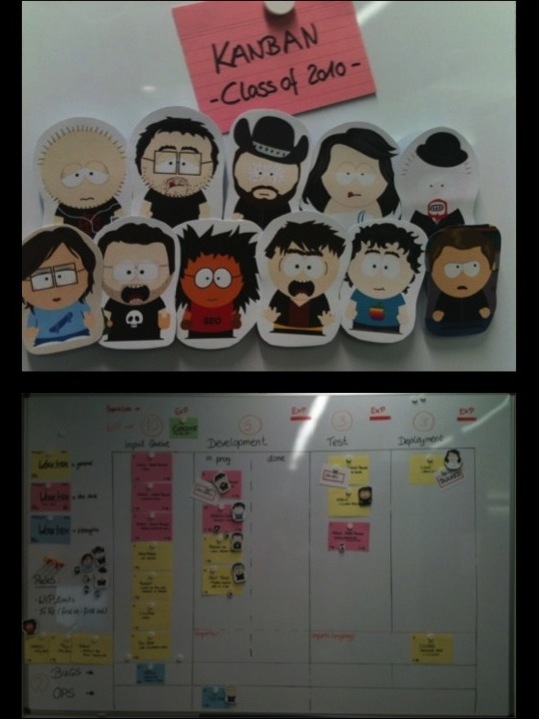 As an explanation: The little Avatars are used to indicate who is working on which item within the workflow (large Avatars for main work items/mini-me’s for supporting tasks of other work items). Last Thursday was the day we started working with the tools that make KANBAN so practical, so we thought it would be a good opportunity to share this with you. We will keep you posted on our experiences, issues, progress and new findings of our daily ‘walk the board’.